The state briefly took fugitive Robert Stackowitz into custody Tuesday as part of the process of extraditing him to Georgia to face charges related to his escape from a prison camp there in 1968. A state police detective served an extradition warrant on Stackowitz, 71, at Superior Court in Danbury. Stackowitz's lawyers, Norm Pattis and Kevin Smith, immediately filed a petition for a writ of habeas corpus challenging the legality of the arrest. "We are not waiving extradition and are requesting a hearing to contest extradition," Pattis told Danbury Superior Court Judge Dan Shaban. Pattis told Shaban that Stackowitz has a variety of serious medical issues, including congestive heart failure, diabetes, chronic obstructive lung disease and bladder cancer. "Our fear is if he is incarcerated, the stress of incarceration would kill him," Pattis said. Pattis also asked that Stackowitz be released on bail until a Sept. 26 hearing on his petition. Danbury State's Attorney Stephen J. Sedensky III and Assistant Attorney General Steven Strom did not oppose Pattis' request for bail and the judge set bail at $100 cash. Stackowitz posted bail Tuesday afternoon. For a brief period Tuesday, it appeared Shaban would not allow Stackowitz to post bail and that he'd be taken into Department of Correction custody. Stackowitz, who said during a May interview that four days at the Bridgeport jail nearly killed him, was visibly shaken. After court, Pattis said he plans to go to federal court in the next several days as he continues to work to keep Stackowitz in Connecticut. "This fight's going to go on as long as we've got energy and we've got plenty of that," Pattis said. Stackowitz, a Bridgeport native, found himself in Georgia in 1966 after his marriage fell apart. He was 21. He met two men who proposed they burglarize a house. Stackowitz, who had a car, was to be the getaway driver. During the burglary, the victim arrived home and the three tied the man up. As they drove off, a police officer began to chase them. All three were quickly arrested. A short time later, and after a 15-minute trial, Stackowitz was convicted of burglary by force and sentenced to 17 years in prison. In 1968, about two years into his sentence, he drove away from the camp in a vehicle he used to travel around the state to repair school buses. He drove to the Atlanta airport and bought an airplane ticket home to Connecticut. 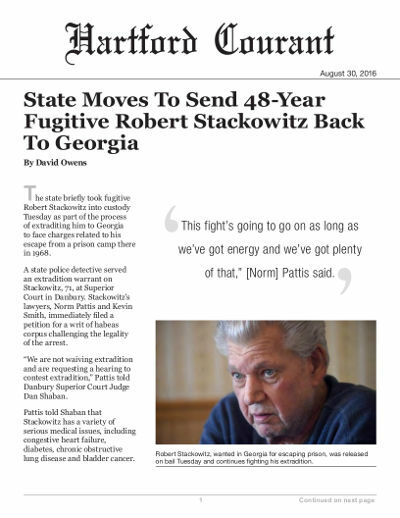 Steve Hayes, a spokesman for Georgia's Board of Pardons and Paroles, has said that Stackowitz must return to Georgia so the agency can review his case and determine what action to take.